Just like Jethro Tull and Pink Floyd (“by the way, which one’s Pink?”), Jack Dupon is not a solo artist, but a French quartet whose debut album, L’Echelle du Désir, was released in the second half of 2008. It is also the name of the fictitious character whose picaresque stories are told in the band’s songs and live performances. Formed in 2001 by three school mates, Arnaud M’Doihoma, Gregory Pozzoli and Thomas Larsen (now in their late twenties), in 2004 Jack Dupon was joined by an older, more experienced musician, guitarist Philippe Prebet. In September 2010 the band embarked on their first US tour, playing in venues such as the legendary Orion Studios in Baltimore, as well as the ProgDay Festival Pre-Show – their quirky, theatrical performances leaving a strong impression on American audiences. My first contact with Jack Dupon occurred in 2009, when I reviewed L’Echelle du Désir, and was left with mixed feelings. While I could not help appreciating the band’s eclecticism and the undeniable impact of their music, I also felt they had been overambitious in recording an album that clocked in at nearly 75 minutes, and opened with a 30-minute epic. It seemed that the members of Jack Dupon, as talented and inventive as they obviously were, had not yet learned the valuable lesson that sometimes less is more – with the result that the album, after a while, overstayed its welcome. This time around, however, they seem to have heeded the advice of most reviewers, and gone for a relatively pared-down offering, slightly over an hour long, and avoiding the over-indulgence of L’Echelle du Désir’s two sprawling epics. Unlike other bands placed under the RIO/Avant umbrella (a subgenre that is much more diverse than its detractors might think), Jack Dupon use a very traditional rock instrumentation – which means no strings, no woodwinds, no saxes, and even no keyboards. Indeed, their configuration (two guitars plus rhythm section) closely resembles King Crimson’s in the Eighties and onward – and Fripp’s crew, together with Frank Zappa, are clearly one of the main inspirations behind Jack Dupon’s output. However, the theatrical bent of the band, as well as the ‘mythology’ on which their music is based, possess an unmistakably European flavour. While their French origins bring to mind concept-based bands like Magma and Gong (as well as Ange, a clear blueprint for the vocal department), some Italian bands of the Seventies are also evoked, especially those that, like Jumbo and the short-lived Pholas Dactylus, pushed the dramatic element at the forefront of their sound. One of the biggest obstacles for people who approach Jack Dupon’s music are undeniably the vocals, mostly handled by bassist Arnaud M’Doihoma with the assistance of his bandmates. Harsh, grating and exaggerated, reminiscent of Ange’s Christian Descamps or even Jumbo’s Alvaro Fella, M’Doihoma’s singing style fits the music like a glove, but is likely to put off those who like a more traditional approach. Personally, I see the vocals very much as another instrument. From the instrumental point of view, though there is plenty of razor-sharp riffing, Jack Dupon’s sound hardly ever suggests the heaviness of metal, but rather the angularity of King Crimson – with interlocking guitar lines very much in Fripp/Belew style, insistent to the point of occasional monotonousness, and frequent surges followed by pauses of relative calm that create sonic peaks and valleys. The undercurrent of zany, Dadaist humour running through the album (also reflected by the titles, as well as by the nonsensical lyrics and distinctive artwork suggestive of German Expressionism) – echoes not only Zappa, but also Gong (whose flying teapots are referenced in “Le Château de l’Eléphant”), RIO/Avant bands like Samla Mammas Manna and Höyry-Kone, and borderline progressive bands like Primus and Les Claypool’s Frog Brigade. The tracks on Démon Hardi (“Bold Demon”), with the sole exception of the Middle-Eastern-tinged instrumental “Sombre Trafic Sur le Nil”, an unusually melodic, guitar-driven piece, are all over 6 minutes in length, though this time the longest number is strategically placed at the album’s close. The remaining tracks are prevailingly similar in structure, with an ‘ebb and flow’ movement that alternates slow, almost ominous passages and frantic ones, the vocals used sparingly but forcefully to add further intensity to the musical texture. The Zappa influence clearly surfaces in the more upbeat sections, as in the almost cheerful “Le Château de l’Eléphant”, a veritable drum tour de force with a classic rock feel in the guitar parts and occasionally funky touches. “Cravate Sauvage”, on the other hand, is somber and somewhat monotonous, spiced up with effects-laden guitars seemingly ‘conversing’ with the drums in the style perfected by King Crimson in their Eighties period; while “La Marmite du Pygmée” drags a bit at times, but features some outstanding guitar work. The longer tracks (such as opener “Le Labyrinthe du Cochon” or the jazz-meets-King-Crimson “Jeudi (de) Poisson”) offer plenty of changes, even though an impression of patchiness may occasionally emerge – as on closing track “Oppression, Dépression, Les Valeurs du Cool” (at 13 minutes the longest track on the album), whose riff-driven intro hints at metal and is then followed by a sedate, melodic section with a bluesy guitar solo, then climaxes with a choppy, funky passage. 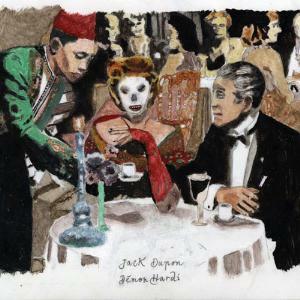 As other reviewers have pointed out, Jack Dupon’s music seems to be tailor-made for the stage – which means that its effectiveness is not always as strong as one might expect when heard on CD. While the vocals are undeniably an acquired taste, they go hand-in-hand with the music and the concept behind it, and it is not hard to imagine that a live setting would increase their impact exponentially. The somewhat repetitive, jam-like nature of the music, with its often hypnotic pacing, also seems to be much more suited to live performance than more or less ‘passive’ listening. On any account, even if clearly not everyone’s cup of tea, Démon Hardi is definitely an interesting album, and Jack Dupon a very promising band that have obviously grown a lot since their debut. Though their musical offer may not be to everyone’s taste, and needs the right disposition on the part of the listener to be appreciated in full, they manage to deliver a product in which the various influences are reworked in a genuinely personal manner. At the time of writing, Jack Dupon are about to embark on a European tour, and are scheduled to appear at the 2011 edition of the Rock in Opposition Festival (Carmaux, France) in September. Thank you so much Rafaella for you honest, open, well thought out and professional review of Jack Dupon’s CD ‘Demon Hardi’. I couldn’t agree more with both your cons and pros about the CD, and the assertation that Jack Dupon live is really the way to best appreciate the band. Once again, you’ve seem to have hit the nail on the head with your review, as you so often do. Thanks, and keep up the great work. You’ve turned me on to so many bands that I might never had heard of. I love this album! Jack Dupon is everywhere! have you received our new album “Bascule a vif”? If not, tell me and I’ll send it to you. We’ll be back in USA for a second tour in september, hope to see you there.